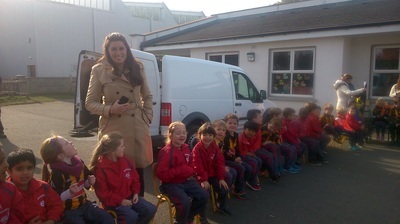 On Friday 16th October a very special visitor came to visit us. 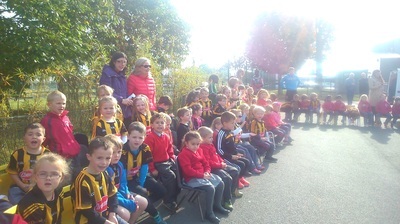 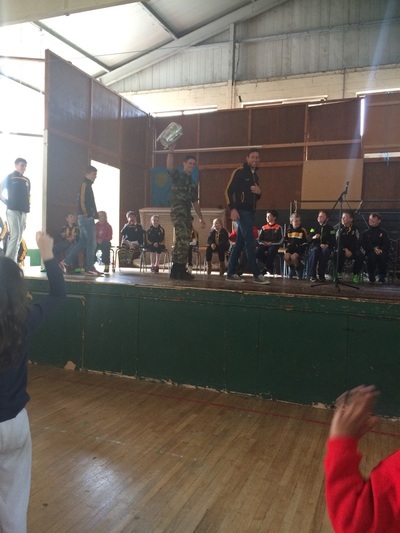 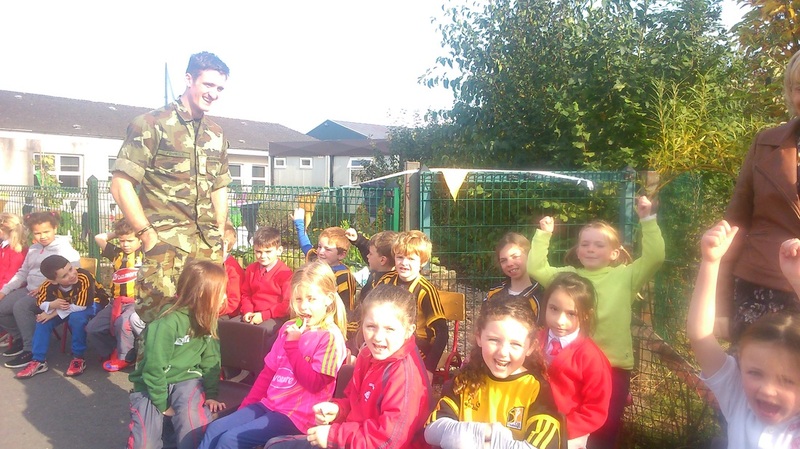 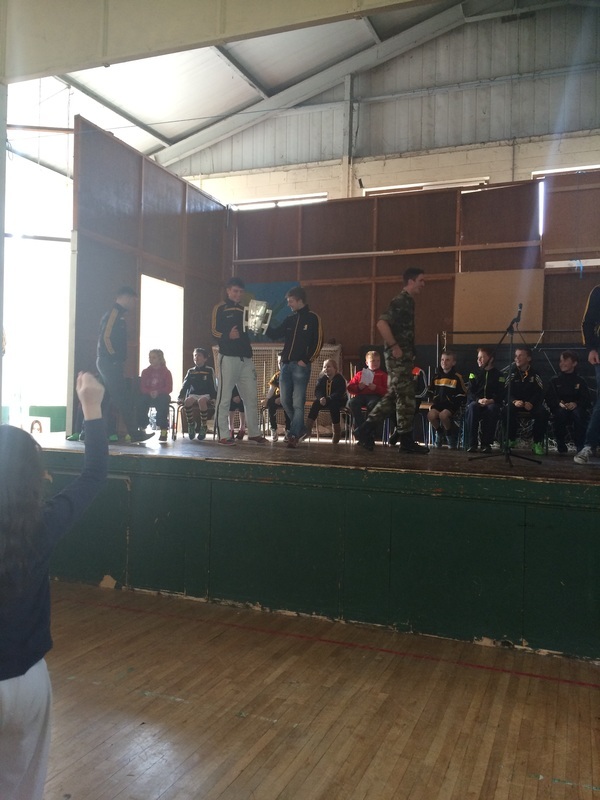 Liam McCarthy was held aloft by Michael Fennelly as hundreds of excited children from Junior Infants to First Class formed a guard of honour for their heroes. 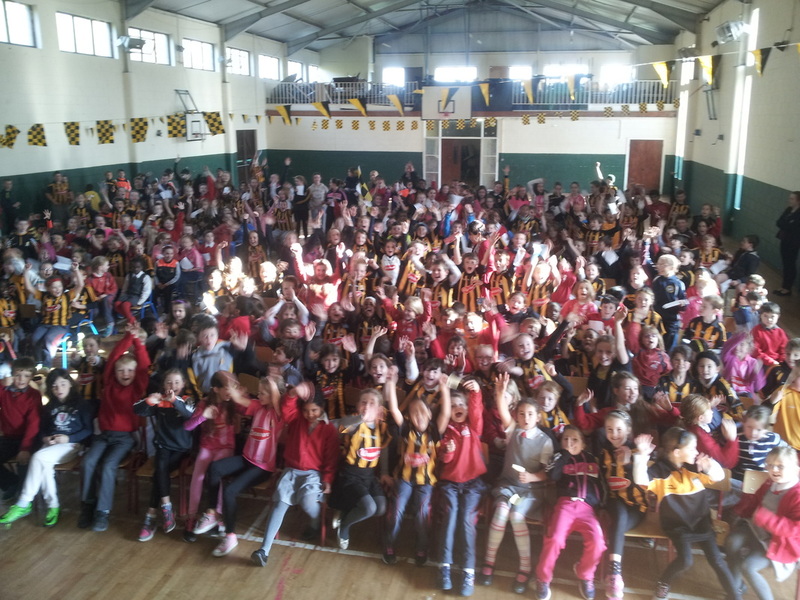 Then it was on to the hall where another 350 kids cheered in welcome. 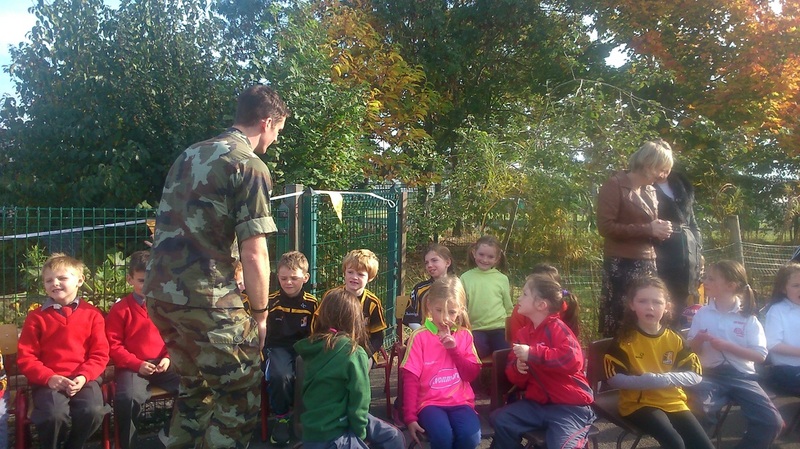 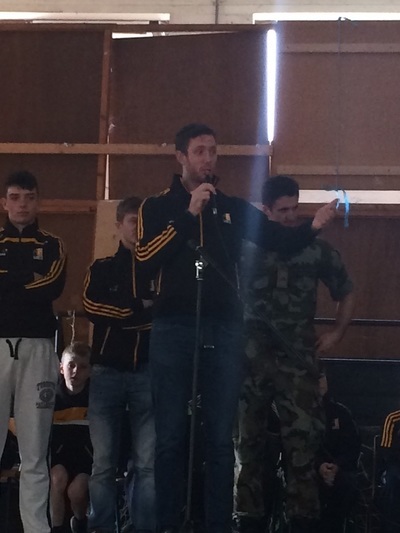 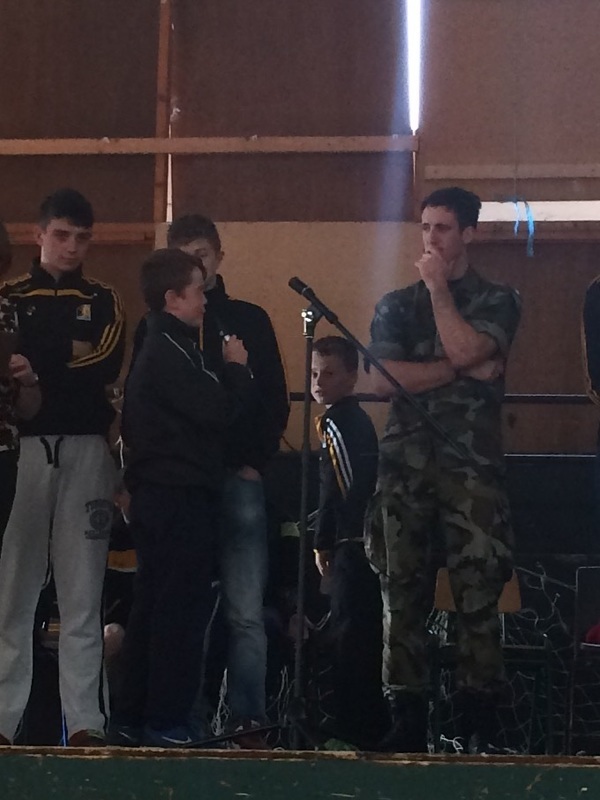 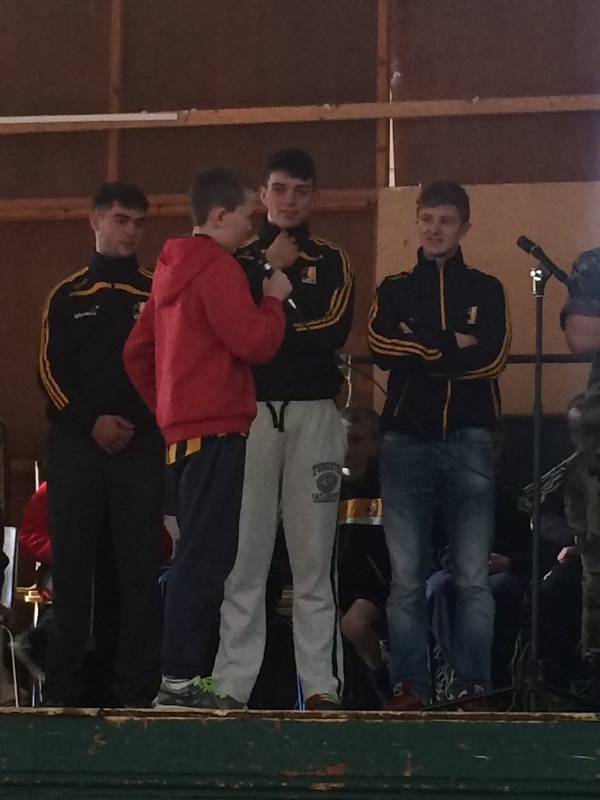 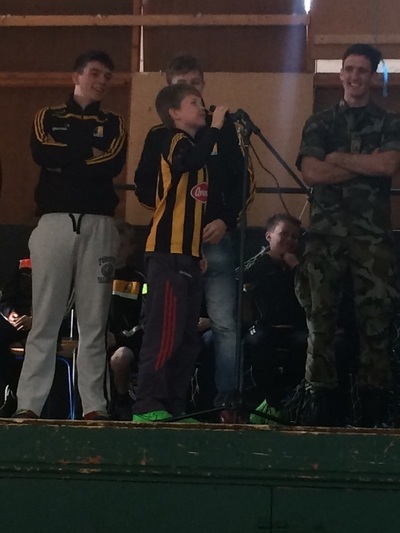 Accompanying Michael was his brother Colm and some very important young hurlers. 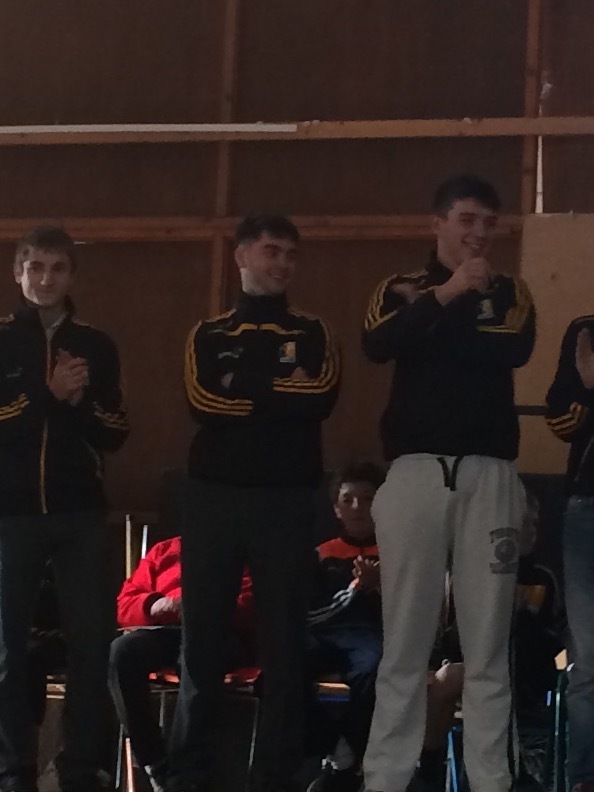 Ex pupils Bill Sheehan, Conor Doheny, Evan Carroll,and Robbie Murphy together with local clubman Andrew Gaffney, all of whom featured on the Kilkenny minor team this year or last, were there to encourage the children to keep playing hurling, to do their best and to listen to their mentors---- the same mentors who had guided them to success at primary school level! 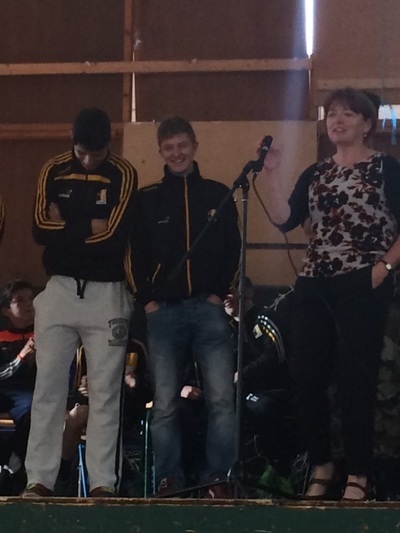 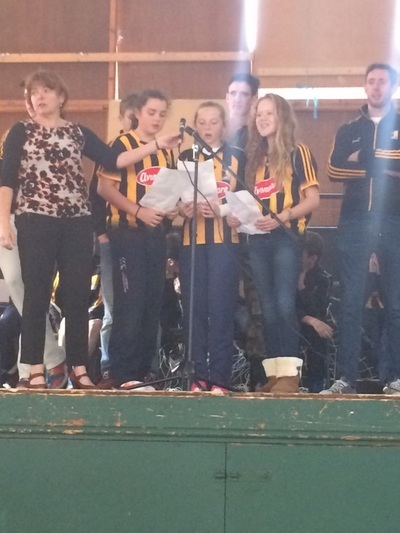 Cezy Fosca who had represented Kilkenny in the flag waving welcome to the hurlers in Croke Park on All-Ireland day was also on stage and to a rousing chorus of 'Cezy! 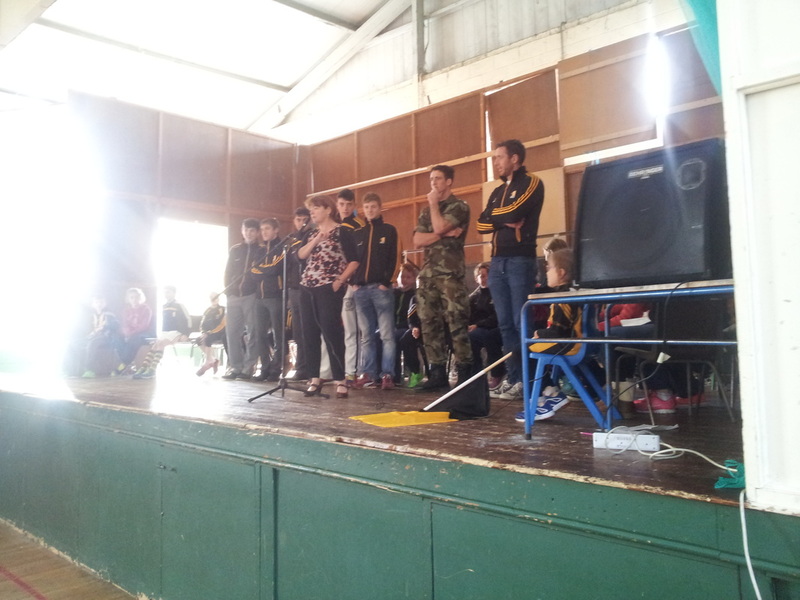 Cezy!' 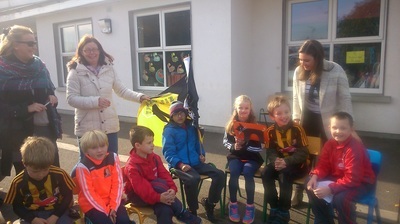 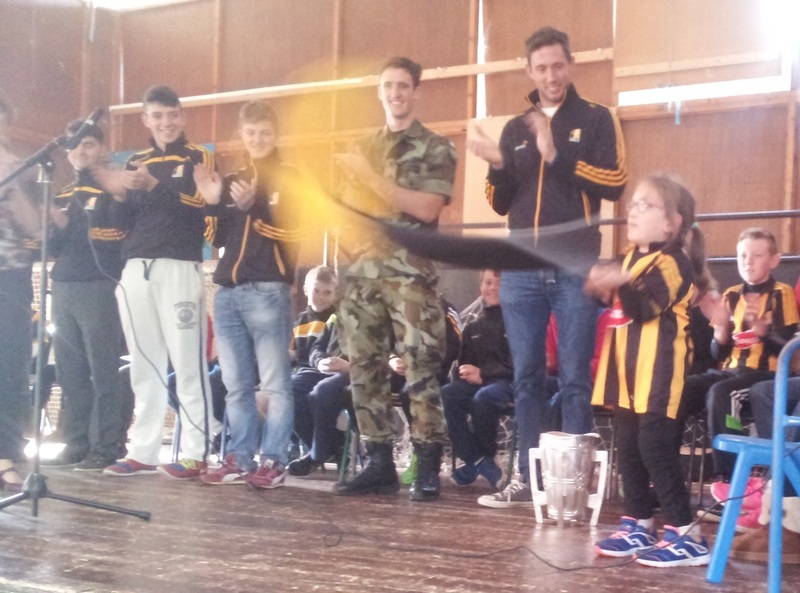 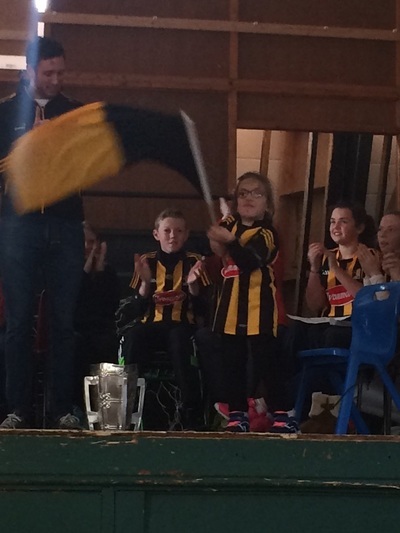 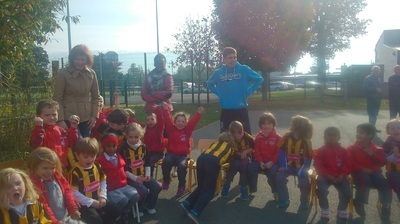 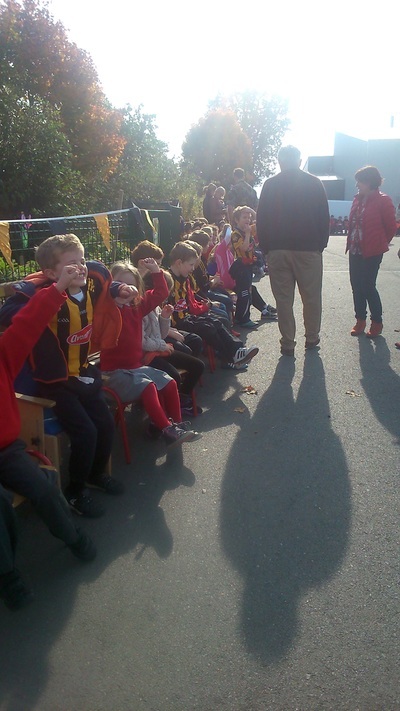 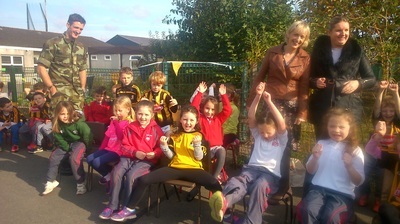 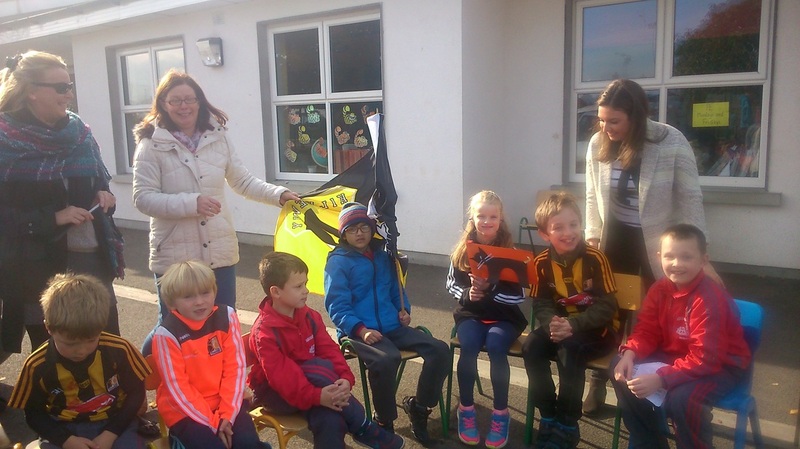 from the other pupils waved her flag once again when the hurlers arrived. Also on stage were a group of children to ask thoughtful and intriguing questions of the players. 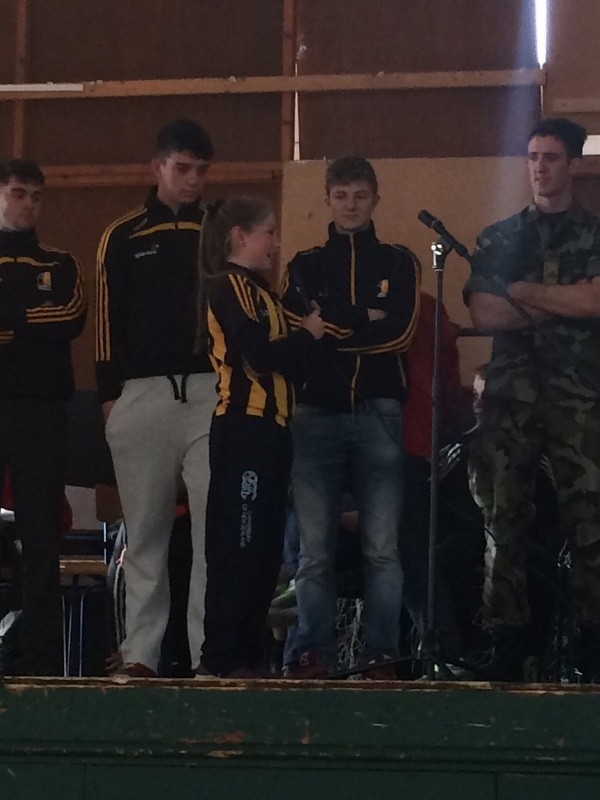 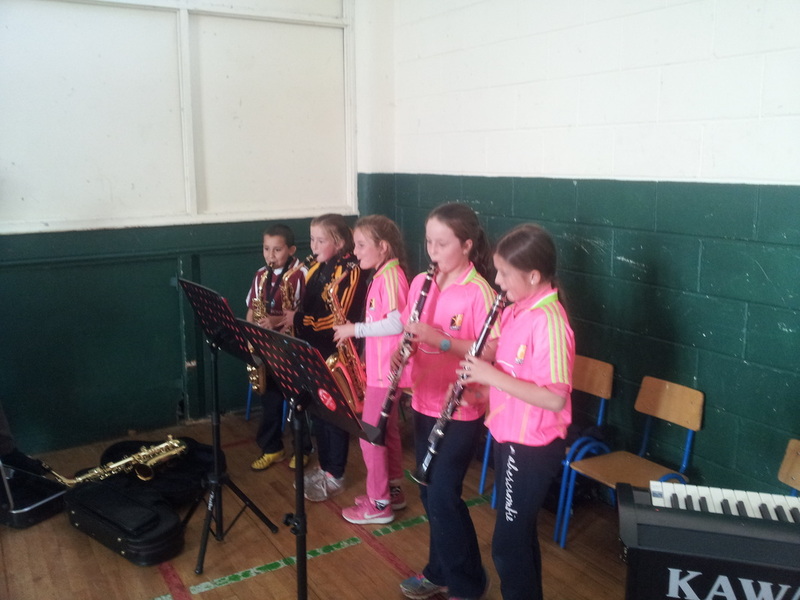 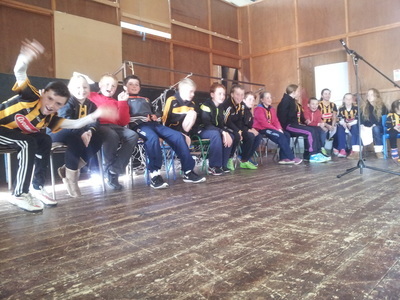 Five children from 4th Class played 'Galway Girl' on their clarinets and saxophones to remember our opponents. The hurlers were thrilled with a rousing rendition of The Rose of Mooncoin by the children led by Polly, Eva and Alison.